An easy to use project reporting chart software that helps create project reporting charts and graphics freely. You may have been fighting fatigue and sleepiness day and night to collect, analyze and collate materials. But only you know how much hard work you have put into it. Sometimes, the leader or other audience only judge according to your report. So a perfect report is vital regardless of the brutal fact. If you are a person pursuing perfectness, a perfect tool is right here for you to create project reports. It is the best alternative for the time intensive, costly and error prone manual creation. Included are functionalities like automatic generation from examples, quick access to text tools, clipart and hyperlink, all for your goal to shine during the report. It supports project status reports, project progress reports, Gantt charts, calendar schemas reports, user task summary report, timesheet reports and disk usage reports. Discover why Edraw is the most outstanding project reporting chart software: Download it Now. 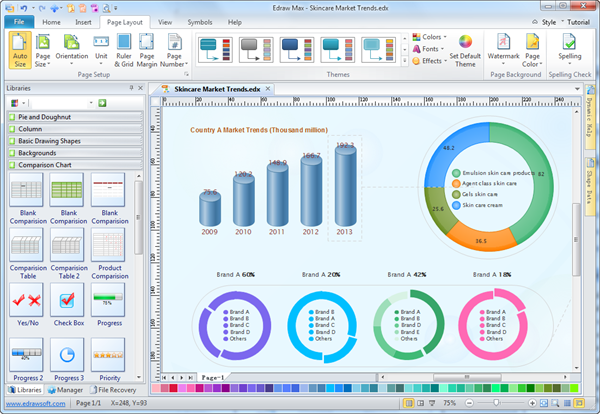 Edraw Project Reporting software is used to create templates for project status reports. For those already used to other Microsoft apps such as Word or Excel, the interface will be very familiar. Simply drag and drop symbols, apply built-in design themes, and automatically share your finished project reporting into a presentation or PDF with one click. Visualize the data and information you have collected so that you can simplify complicated ideas and foster communication. Link your project reporting charts to one or more data sources including Microsoft Excel, web pages, attachment or notes. Multiple layers of information can be presented in one chart. Break through the limitations of traditional organizational diagramming with Edraw! Drag and drop functionality, smart shapes and vector symbols all together make Edraw project reporting software unparallel. It integrates best-of-breed features to generate first-rate results. Export reports to SVG documents in various formats including Excel, HTML, Powerpoint or PDF. Printing is exactly "what you see is what you get". With both digital and paper version of materials, your report will definitely shine among the crowd and impress everyone.